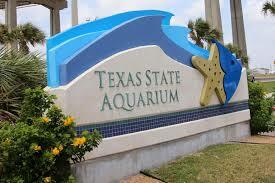 Texas State Aquarium in Corpus Christi TX. Photo by Klaira Edwards / Texas State Aquarium (public domain image). Texas State Aquarium; Texas State Aquarium. Photo by myself/My Photo (Public Domain Image). Located in Corpus Christi, Texas State Aquarium is a nonprofit organization with a mission to connect people with nature and inspire conservation of the Gulf of Mexico and the Caribbean Sea. The aquarium offers indoor and outdoor exhibits and a variety of educational presentations throughout the day.